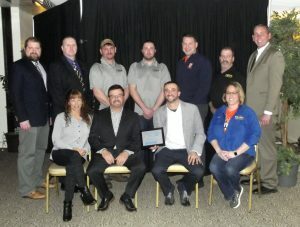 OSWEGO, NY – United Way of Greater Oswego County recently recognized Burritt Motors of Oswego with its Spirit of Community Award at the organization’s Salute to Volunteers and Leadership Giving Luncheon held at The American Foundry. Burritt Motors was honored with the United Way of Greater Oswego County’s Spirit of Community Award at the United Way’s annual meeting. Seated from left are Brenda Burritt, Chris Burritt, Rich Burritt, and Cheryl Camp. Standing from left are United Way Board President Clark Stanton of Oswego Valley Insurance Agencies, United Way Board Member Rob Rolfe of Harmony Financial Services, Burritt Motors employees Justin Taber, Chris Owen, Mike DeForge, John Yard, and United Way Executive Director Patrick Dewine. 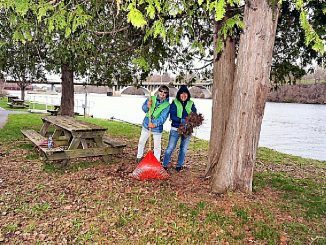 The award is presented to an organization or individual that demonstrates a strong commitment to improving the quality of life in Oswego County.